Poetry written on a scrap of paper in the middle of the night, by a friend of 62 years, has set artist Susan Marcley on a journey that she feels “was meant to be.” And as her life story unfolds this would certainly seem to be true. Born and raised in North Dakota, Susan married young to a career air force pilot. A stay-at-home wife and mother, she traveled and lived with him in many countries, as well as numerous states in the U.S.A. When one of those trips stationed the family in Germany in the ‘60s, Marcley decided to study painting. That endeavor opened up a whole new world to her, changing the way she looked at the things around her. With new eyes she discovered vivid and varied colors in all her surroundings, and that discovery engendered strong compulsions to paint the things she saw. The artistic training Susan received in Germany was mainly in landscapes, still life and figurative painting … all influenced by the Dutch masters. She worked very hard to master that style, and when she returned to the states to live in Panama City FL., the people she met there began admiring her paintings, asking if she could teach them to paint like that. Before long Susan’s husband’s career sent the family trekking off to Europe once again … this time to Italy. Living there, she took an interest in the works of Carvaggio and the frescoes and murals painted in the churches and cathedrals there. While those influences led her to continue developing her present style of painting, they also fostered a desire to someday learn the art of portraiture. When Marcley’s marriage of several years eventually ended in divorce, she and her children relocated to Newport Beach, CA. where she continued pursuing her artistic passion. While residing there she kept in touch with her childhood friend, Judy Rae Smith, an aspiring writer living in Scottsdale, AZ. Friends since first grade, they supported and confided in each other, sharing the intimate and important happenings in their everyday lives. A part of that sharing was Judy’s writings. She often sent them to Susan, and cherishing them Susan saved them all, among them the aforementioned poem. During that same period Susan Marcley’s life took an unplanned turn. On a blind date, set up by her mother who had a summer home in Brownsville, TX (in the same area as the mother of her future husband) she met Bob Marcley. Bob had inquired of Susan’s mother whether she knew someone age-appropriate that he could date. She recommended her daughter, but told him she lived in California. His response was, “fine, what’s her number.” That phone call led to a first date on Valentine’s Day in Brownsville, (where Susan thought it safe to date because she could stay with her mother) and a telephone courtship between Chicago and CA. that ultimately spawned a 28 year marriage. Happy in a new marriage, Susan continued honing her art. At an artist’s workshop, she met Rafael Maniago, a portraiture teacher. Under his tutelage she began her long time dream of studying portraiture in the realistic style of the old masters. The styles she had seen and loved in the frescoes and murals in the churches and cathedrals in Italy. And as fate would have it she got an unexpected opportunity to return to Italy. Two years later Susan applied to the school and was accepted. Living for a time in Florence, Italy, she attended the Academy studying under Michael John Angel, learning the style of fresco muralist Annigoni. Michael John Angel’s philosophy was, “why reinvent the wheel when you can stand on the shoulders of giants.” During this time of study Marcley did just that, spending three months drawing from live models in graphite pencil, continuing her pursuit of the realistic styles of the old masters. As close friends in pursuit of their artistic endeavors, Susan and Judy had thought for a long time of combining their talents. On those sabbaticals in Italy they decided they should write a book together. The anticipated birth of twins by Judy’s daughter - who had struggled to become pregnant for a number of years - gave them the idea they were looking for. So when the two friends returned to the states, having no clue about how to go about writing, illustrating and publishing a book, they decided to attend the Society of Children’s Books, Writers and Illustrator’s Conference held in New York City. Sensing her feelings of concern, Susan’s husband, Bob, bought her a beautiful leather case for carrying her work so she would at least, “look good.” But she had no reason to fear, as the gentleman critiquing her entries told her she was a master of her craft, and a woman attending the class told her she was so touched by her work that she was reluctant to comment as she was afraid she would burst into tears. 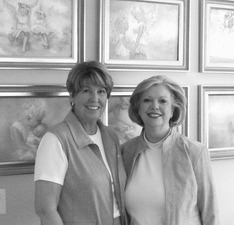 Upon returning from that conference, for the next two years Susan and Judy set to work creating a book of prose and paintings, they entitled “Birth of an Angel.” Their intention was to market it to high end baby shops, hospital gift shops, religious stores and art galleries, to be given as gifts for births and other special occasions. And it would be in San Clemente that their book would finally come together. Like many San Clementeans, Susan and Bob, came to the village in pursuit of a one-story retirement home. They learned about the proposed Talega project from their son, a developer who knew about the area through colleagues in the business. Riding in a jeep around the proposed project they fell in love with the area and the town, and having searched for five years all over the U.S. decided it was the only place they wanted to live. While visiting Studio 104 on Ola Vista, where one of Susan’s present art students displayed her work, she and her friend Judy saw a book on the counter that looked exactly as they had envisioned theirs to look. On speaking with Wayne Forsberg, who creates Giclees and does custom framing at the gallery, they discovered he could help them pull it together. He recommended Shane Townsley, owner of the gallery to help with postcards, business cards and other accoutrements. Since the local Chamber of Commerce had published the book the duo had seen, Judy contacted them and learned that the San Clemente Journal’s publisher/owner Don Kindred had put it together. And fate stepped in once again, as Don happened into the store during their visit. They hit it off right away and it would be Kindred who finally made the book become a reality. As Susan Markley enjoys a new home, a new place and a new life journey, one senses she may be looking back, seeing signs of events constructed one happening upon another, to bring about a present she never really imagined. And perhaps, as it often seems, fate does play a part in living, and some things truly are “meant to be” after all.